How can a car that requires no liquid fuel get 121 miles per gallon? 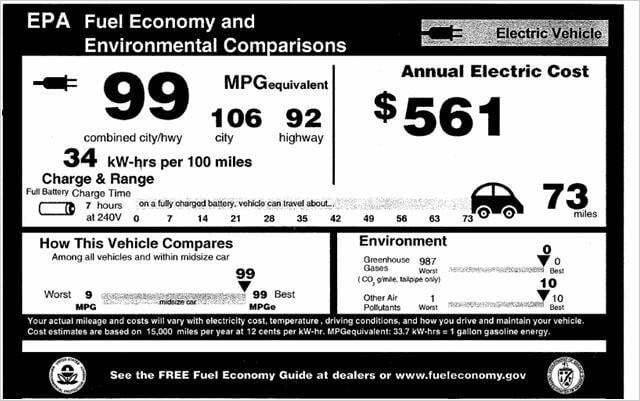 That’s exactly the paradox you’ll encounter when looking at the window sticker of a 2013 Scion iQ EV which, in the Environmental Protection Agency’s (EPA) fuel economy tests returned 121 MPGe (miles per gallon equivalent) combined. When the Chevrolet Volt and Nissan Leaf launched in 2010, the EPA thought it would be a good idea to update its ratings for non-liquid fuels. With more battery electric vehicles (EVs) and plug-in hybrids hitting the market every year, it’s an increasingly important task. Here’s how the EPA gives electric cars fuel economy ratings. It’s important to remember that electricity has its own efficiency scale. In addition to putting an EV’s MPGe on the window sticker, the EPA includes kilowatt-hours per 100 miles (kWh/100m). On said window sticker, you’ll find this number in small print, to the right of the car’s combined (big print), city, and highway MPGe numbers. Taking a second look at the Scion, we see that it’s rated at a much more reasonable sounding 28 kWh/100m combined. For another example, take the more mainstream Leaf: it’s rated at 99 MPGe, but only 34 kWh/100m (both figures combined). Why does kWh/100m go down as MPGe goes up? One is a measure of energy consumption while the other is a measure of energy efficiency: using less energy (be it kilowatt-hours of electricity or gallons of gasoline) to travel a given distance makes a car more efficient than one that uses more energy to travel the same distance. So, since the Scion uses fewer kWh to travel 100 miles than the Nissan, it’s more efficient and gets a higher MPGe number.